Dust allergies are one of the most commonly reported allergic reactions. However, this allergy is not caused by dust itself, but rather by microscopic dust mites living on bed linen, clothing, or carpets, which are their ideal environments, since they feed off skin flakes. Fortunately, there are ways to reduce your suffering. In order to ensure maximum relief from dust allergies at home, you should make sure you are washing your bed linen at least once every week. It's best to use hot water, with a temperature above 130° F, in order to ensure that you kill all dust mites and their eggs. While it can be tempting to dry your linens in the dryer instead of hanging them outside, making the extra effort to dry them in the sun has some hidden benefits. Bright sunlight kills dust mites, so dry linens the natural way whenever you can in order to reduce the effects of dust allergies. When the body begins to suffer from an allergic reaction to dust, it speeds up the production of histamine, which is what leads to teary eyes, excess mucus, and a runny nose. Vitamin C, among its many health benefits, works to prevent histamine from forming, and it also has great antioxidant properties. Aim to consume about 2000 mg of vitamin C each day. 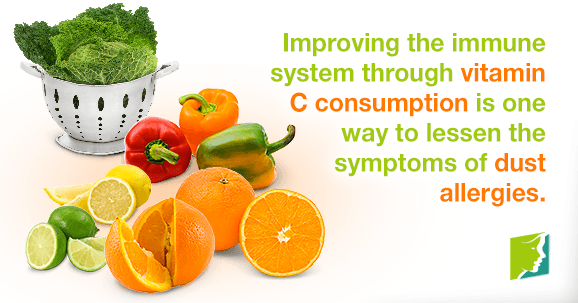 The best sources of vitamin C are citrus fruits, bell peppers, and dark green leafy vegetables. Onions contain a bioflavonoid called quercetin, that can help towards minimizing watering or itching eyes that are caused by dust allergies. About two grams of onions should be consumed every day in order to achieve optimal results. The best thing about increasing onion intake is the additional positive results it can have upon your overall health, since onions can also help fight against asthma, bronchitis, sinusitis, cold, and flu. Having wall-to-wall carpets in your home can mean an excess amount of dust mites, especially if the carpet is laid over a concrete floor, as concrete generates moisture and humidity, an ideal breeding ground for the mites. Try to opt for wooden floors, or, if this is not a possibility, put washable throw down rugs instead of carpets. Being able to wash rugs regularly will remove a great deal of the dust mites that cause allergies. Suffering from an allergy to dust mites can cause a great deal of frustration and irritation, despite how common the condition is. Follow the link for further information on how to handle this menopausal symptom.